Wow, that’s very impressive – and a huge win for SQL Server Professionals everywhere. I’ll be honest: since I spend so much of my time on my clients’ machines when analyzing performance problems and looking at execution plans, I’ve made a conscious effort in the past to avoid using Plan Explorer too much in my Lab – for fear of spoiling myself. This announcement changes all of that – meaning that I’ll have a whole suite of additional tools at my disposal when performance tuning or troubleshooting. 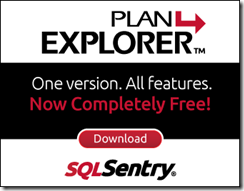 It doesn’t take a genius to see that SQL Sentry is trying to use Plan Explorer PRO to establish a ‘foot in the door’ with as many potential customers and clients as possible. But a maneuver like this only works with a market when you’re providing something that users REALLY want, management can easily see the value being offered, and the tool being offered is really solid (non-buggy). Interestingly enough, that sums up Plan Explorer PRO perfectly.